Avoid running injuries with these eight simple steps. Whether you want to train for a marathon, sign-up for a fun run, or just go for a jog around the block — there are plenty of reasons to get into running. Unfortunately, many beginning runners find themselves injured before they’ve really had a chance to work up a sweat. But if you do your homework and kick-off your running adventure with these eight steps, you’ll find you can carry on for thousands more. Before you lace up your brand-new kicks and head out the door, it can be a good idea to get a professional to look at your lower-body structure. Most running injuries are caused by poor biomechanics and muscle weaknesses, explained sports scientist Tony Boutagy who has trained Olympic-level runners. If your biomechanics cause your feet to strike the ground incorrectly, you will likely end up with ankle, knee and lower-back problems. Externally rotated hips, which cause your feet to splay out to the side (duck feet). Most of the time, these issues can be fixed with strength training and/or orthotics. But sometimes they can’t. “If that’s the case you can always use low-impact forms of cardio like the stationary bike, cross trainer or rower,” Dr Boutagy said. To avoid injuries unprepared new joggers often come up against, start slowly, Dr Boutagy said. “My starting point with people is how far they can walk comfortably,” he said. Once you can walk at a brisk pace for 30 minutes most days of the week, it’s time to start a walk/jog regimen. “Still move for 30 minutes, but now jog for two minutes then walk for eight,” Dr Boutagy said. From that point you’re ready to run consistently. The foot-striking repetition is what causes most overuse injuries in casual joggers, Dr Boutagy said. And change up the terrain regularly. Try running on surfaces other than the pavement, such as stairs, hills, on grass and along rocky trails. Challenging your muscles and joints on different tracks will increase strength and stability. Are you able to jog for 30 minutes straight three times a week? Congratulations, you’re ready to go next level: interval training. Interval training is a short burst of hard-out work, followed by rest, repeated several times. 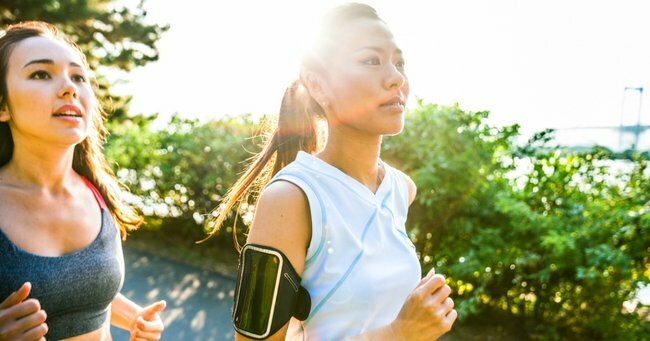 It’s beneficial for many physiological reasons, but when it comes to running, these bursts of intensity will actually make your steady-paced running speed faster. Plus, you’ll recruit your muscles much more efficiently. Cool down for five minutes, decreasing your speed to slow your heart rate. Mid-foot, forefoot, heel striking — there’s a lot of debate over how your foot should hit the ground. But elite runner and running coach, Melissa Vandewater, says none of that is as important as where your foot lands — which should be the centre of gravity. “Aim to get your foot to strike the ground under your body,” she said. Running involves the major muscles in your lower body — calves, hamstrings, thighs and glutes — so it makes sense to ensure these muscles are strong. It’s when they’re weak that injuries occur because the joints they surround aren’t protected. Aside from making your muscles stronger, weight training fixes mechanical faults and strength imbalances between limbs. Not only does this help prevent injury, it makes you a much more powerful runner. “Most elite runners incorporate weight training either for injury prevention or performance enhancement,” Dr Boutagy said. Having a strong back and shoulders will stop you from slumping your shoulders forward when you fatigue, which can restrict breathing. “Being able to relax your shoulders and hold them back is important,” Dr Vandewater says. It’s important. Try to do it twice a week, for about 30 minutes each session. Do 2-3 sets of 12 repetitions for each exercise. Rest for 30-60 seconds at the end of each set. For example: do A1 then A2; rest. Repeat 1-2 more times. Now move to B exercises. Leave at least one day between each session because you’re likely to feel sore. You might be surprised to hear that having a strong core is just as important for running as having strong lower-body muscles. Think of your body as a house — your core is the foundation of that house. If that foundation is shaky, the house will eventually fall over (read: you’ll fall over . . .). But your core is so much more than your abdominals. It’s actually made up of your glutes, lower-back muscles, obliques, diaphragm, pelvic floor and a deep muscle called the transverse abdominal. Not learning to breathe properly (or at all) is where at lot of novice runners go wrong. When their heart rate goes up, breathing becomes uncontrolled, short and shallow. Try keeping that up for more than a few minutes. You want to breathe deeply, Ms Vandewater said, but understand that the harder you work, the more frequent your breaths will be. “Your breath will become quicker, but make sure it doesn’t become short and shallow,” she said. Once you’re strong and stable, running can be an addictive form of exercise. So make sure you factor in enough rest days. Ms Vandewater stresses that recovery is vital if you want to become better at it, while remaining injury-free. “When I first started running I thought more training was how you got better, but I neglected maintenance,” she says. Cassie White is a Sydney-based personal trainer, yoga coach and health journalist.